The Black Bears take on the Gamecocks in the second round of the FCS playoffs at noon Saturday. The first thing you notice about the University of Maine’s opponent in the second round of the Football Championship Subdivision playoffs is that Jacksonville State has a heck of an offense. The Gamecocks average 41.1 points and 499 yards per game. They’re led by sophomore quarterback Zerrick Cooper, a transfer from Clemson who has thrown for 3,051 yards and 30 touchdowns. But look more closely, and you’ll see that Jacksonville State also has a heck of a defense. The Gamecocks give up only 22.3 points per game and are ranked in the Top 20 in four defensive categories, including a nation’s-best third-down defense. Maine (8-3) will play Jacksonville State (9-3) at noon Saturday at Alfond Stadium in Orono. It will be Maine’s second home playoff game in its history. The Black Bears know they’ll be tested. Jacksonville State, one of three teams to qualify for the last six FCS playoffs (the others being North Dakota State and South Dakota State), won the Ohio Valley Conference championship. Unlike Maine’s Colonial Athletic Association title, this wasn’t a surprise. While Maine was picked to finish eighth in the CAA’s preseason poll, the Gamecocks were picked to finish first. And behind its potent offense, Jacksonville State surged to its 16th consecutive winning season. Cooper set school records for touchdown passes and passing yards. Wide receiver Josh Pearson has a school-record 17 touchdown catches – also the most in Division I college football this season – and 1,061 receiving yards. The Gamecocks need just 12 yards against Maine to go over 6,000 yards in total offense for the season. 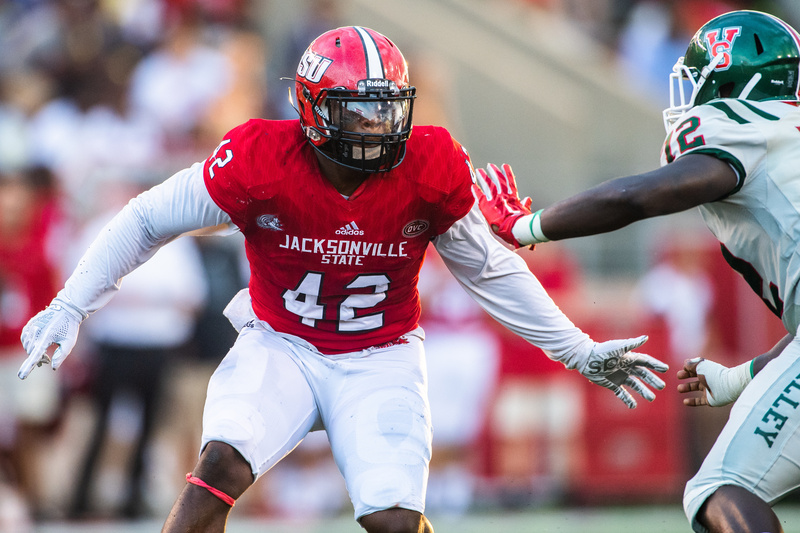 Linebacker Jalen Choice leads Jacksonville State with 81 tackles and 10.5 tackles for a loss. The Gamecocks’ defense is ranked in the Top 20 in four defensive categories. 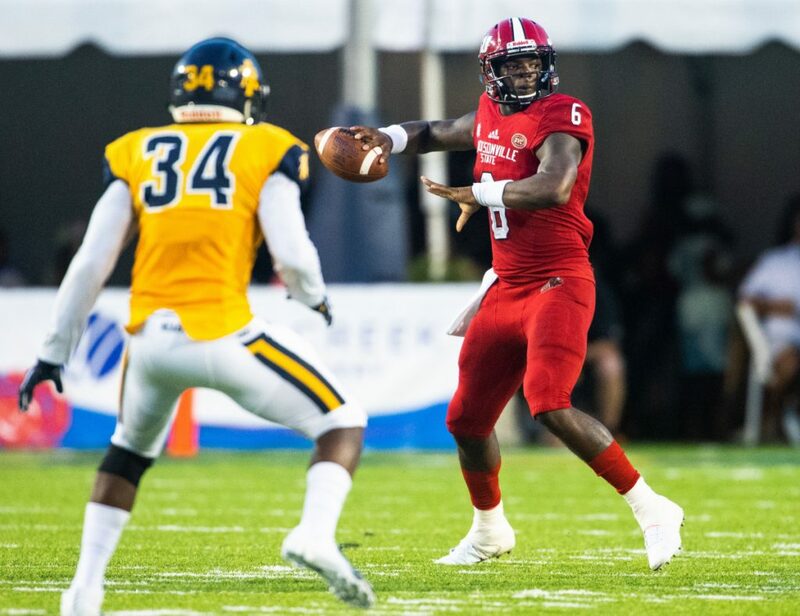 And in last week’s 34-27 comeback win over East Tennessee State in the FCS first round, Jacksonville State also got its running game going, something that might be very important with the Gamecocks coming up to chilly Maine. Sophomore Jaelen Greene became the first running back to rush for over 100 yards in a game this season, with 121 rushing yards. Jacksonville State averaged 7.2 yards per rush. Jacksonville State Coach John Grass knows how important it will be to get Greene, along with redshirt freshman Michael Matthews, involved against Maine, which has the nation’s second-best rush defense, allowing 73.4 yards per game. Greene led the Gamecocks with 707 rushing yards and Matthews (40 yards on three rushes last week) had 397. Maine’s defense has faced great offenses before, Yale and Towson State, in particular. The Black Bears lost at Yale (12th best total offense in the nation) but won at Towson (18th). “I’m confident the competition we’ve seen all year has us ready for playoff football,” said Harasymiak. Defensively, Jacksonville State probably doesn’t get as much credit as it deserves. It plays an aggressive style that can lead to big plays by the opponent. But the Gamecocks often make game-changing plays. They have scored four defensive touchdowns, fifth in the FCS. And if you get into long-yardage situations on third down, good luck. Jacksonville State has allowed only 42 first downs on 170 chances, an astounding .247 percentage. Grass said his offense and defense go “hand in hand. We try to be a solid defense. We want to be a top 10, top 5 in the country every year. That’s the key to winning a championship. You’ve got to start on that side of the ball first. Linebacker Jalen Choice leads JSU with 81 tackles and 10.5 tackles for a loss. Safety Marlon Bridges follows with 61 tackles (along with two interceptions), linebacker Quan Stoudemire has 60 and safety Traco Williams has 58 (along with 8.5 tackles for a loss and a team-high four interceptions).